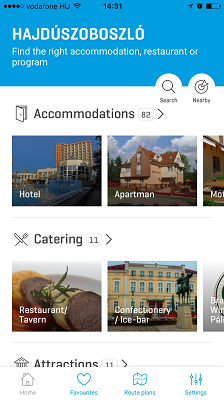 HAPP is an application created by Hajdúszoboszlói Turisztikai Nonprofit Kft., where you can browse the city’s attractions, accommodations, restaurants and shopping opportunities in an easily manageable thematic grouping. You can get instant information with the help of the APP’s local knowledge base about doctors, services, money changers, ATMs and other information, which can be important for both the locals and for visiting tourists. The application provides further help with the use of maps, phone numbers and web pages. The phone program is divided to seven main points in order to help getting around: Bath complexes, Accommodation, Events, Leisure, Shopping and Local knowledge base. 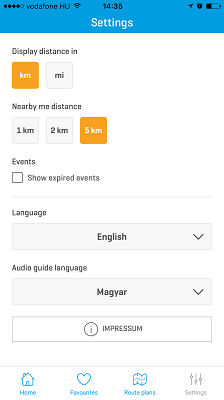 The aim of the application is to provide up-to-date information about events, accommodation, discounts in Hajdúszoboszló and its vicinity, and about any other information which may be important for those staying in the city. 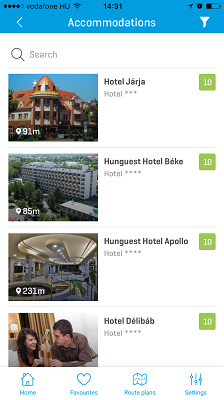 We aimed to create useful and informative functions for the users, which help them have a pleasant vacation at Hajdúszoboszló! The HAPP application does not require registration. You can find information about availability in the accommodation subpage, which is not updated in an online system, but based on the preliminary indications of the accommodation establishments. The operators of the application does not take responsibility for the information displayed in the application. For up-to-date information, you need to check in with the accommodation establishment as well. Service providers, event organizers, listed in the application, reserve the right to change the opening hours, start times, programs and contact information.